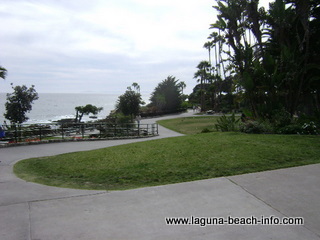 Heisler Park is a beautiful grassy park which sits on the bluffs directly above several North Laguna Beach beaches. 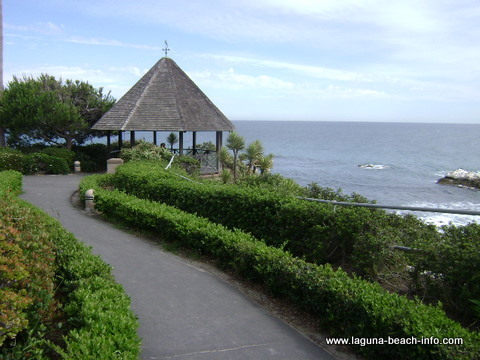 It is here that you'll find the popular Laguna Beach Gazebo, which is one of the most photographed spots in Laguna Beach and the site of many wedding ceremonies! There are expansive grassy areas and several picnic tables scattered around the park, which makes Heisler perfect for family picnics. Fantastic ocean views can be seen from throughout the park, and there are telescopes mounted at Recreation Point. On clear days- it looks like you can almost reach out and touch Catalina Island! From several view spots, you can look straight down into the water and see the amazing green and blue colors of the tidepools and kelpbeds. In addition, there are stairs which provide direct access to: Main Beach, Rockpile, Picnic Beach, and Divers Cove. 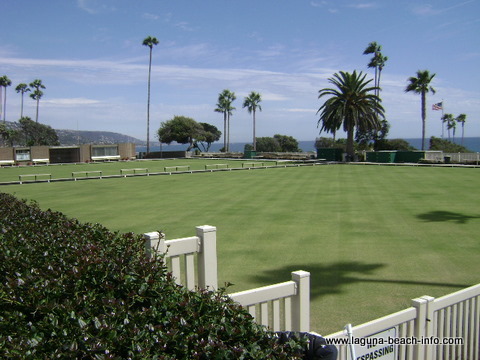 (Lawn Bowling Club) On some days you can watch members of the Laguna Beach Lawn Bowling Club playing on the manicured greens located at the top of the park. 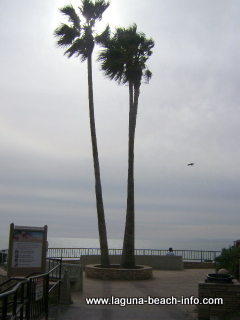 Its also nice to know that there are two public restrooms at Heisler Park. Countless amazing ocean views can be seen throughout the many walking paths that can be found in Heisler Park! Monument Point is a great scenic overlook area with semi-circular concrete benches and a telescope to get a better look out across the ocean or along the bluffs of Heisler Park. (Picnic Tables at Heisler Park) There are many, many picnic tables at Heisler Park. Some areas are located on large grassy stretches, and others like this are tucked in the trees- but they all boast panoramic ocean views! Heisler is just a short walk from numerous downtown shops, galleries, and restaurants in North Laguna. My favorite restaurant is right across the street- Madison Square Garden! You’ll love the both the fresh and unique food and the atmosphere! (and they’re dog-friendly!) Another casual choice is Gina's Pizza. Las Brisas is also adjacent to the park and they serve breakfast, lunch, and dinner. If you’re thinking of going to Las Brisas, I recommend the Sunday brunch and then a walk along the cliffs at the park! (Make sure to ask for a table at a window or outside on the patio, so you can enjoy the ocean views! There are also two Starbucks across the street and several ice-cream shops nearby- Haagen-Daaz, Gelato Paradiso, Chantilly Ice Cream, and Golden Spoon. 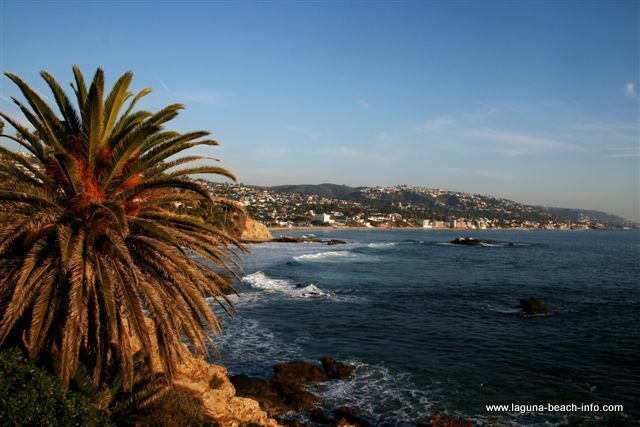 Visit the Laguna Beach restaurants page to find more restaurants near Heisler Park. Metered parking can be found adjacent to Heisler Park all along Cliff Dr, Coast Hwy and most side streets. If you don’t want to pay for parking and don’t mind walking, you can also find free parking in residential neighborhoods- be careful to not block anyone’s driveway! Share Your Heisler Park Photos! Do you have some great photos from Heisler Park? 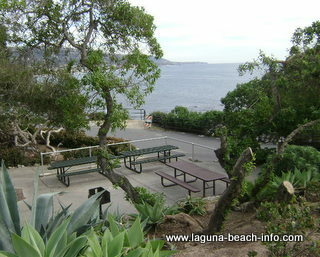 Share your stories and pictures from this beautiful Laguna Beach park or add your review here!